A four-year-old boy is spending the holidays in the hospital after a Christmas present sent him into surgery. 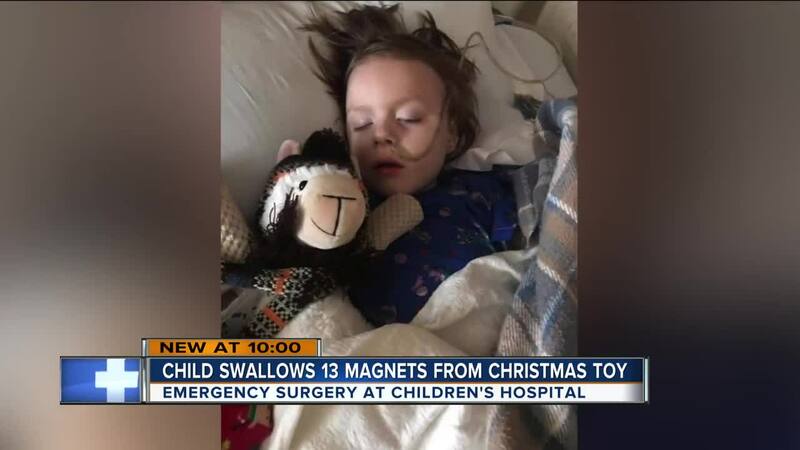 The boy had to have part of his colon and intestines removed because he ingested parts of a popular magnetic toy. MILWAUKEE — A 4-year-old Wisconsin boy is spending the holidays in the hospital after a Christmas present sent him into surgery. The boy had to have part of his colon and intestines removed because he ingested parts of a popular magnetic toy. Beck White got sick right around Christmas. His mother, Jennifer White, said at first she thought her son had the flu. "He started to vomit a very dark color. It looked like coffee grounds. At that point I knew something was very wrong," White said. White and her husband rushed their son to the hospital in Appleton, Wisconsin before he was sent to Children's Hospital of Wisconsin in Milwaukee for surgery. They say an x-ray showed Beck had swallowed the magnets inside his toy. "He had swallowed 13 of them," said White. "He snapped them right open and started to ingest them. And of course we had no idea." Once the magnets were inside him, Beck's mom said they started to cut holes in his intestines. "When he individually ingested them they were doing what magnets do and trying to get to each other through his intestines. And it created holes in the lining so they had to fix those," White said. His mom said Beck is autistic so they are usually very careful with his toys. But she says now she will not bring any toys with small magnets into their home. She shared the story on Facebook so others would know about the dangers of these magnetic toys. "I really thought these were safe. Absolutely thought he would be OK. If I had an inkling that this would have happen I would have just got rid of them," she said.